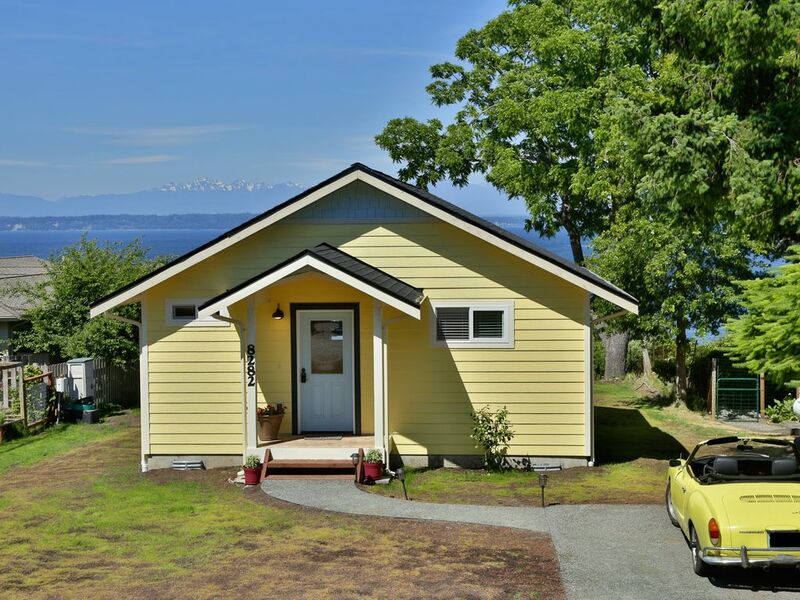 Whidbey Coho Cottage is located on South Whidbey Island convenient to the Mukilteo/Clinton Ferry route, Langley, and a short walk to beach access. Our home offers views of the Puget Sound Shipping Lanes and the Olympic Mountain range, along with abundant nature - deer and eagle sightings are frequent. The Cottage is situated in a quiet community perfect for a relaxing stay away from hustle and bustle of daily life. Whidbey Coho Cottage offers 2 bedrooms (bedroom 1 features a queen bed, bedroom 2 features two twin beds), 1 full bathroom (hairdryer and basic toiletries provided), a well equipped kitchen (refrigerator, range, dishwasher, microwave, coffee maker, dishes, pots and pans, etc. ), laundry with full-size washer/dryer, living room with Cable TV, DVD player, board games and plenty of comfortable seating. The covered view deck features a seating area and a gas grill ready to light up. All linens are included and the kitchen is stocked with basic spices for preparing a meal at home. There is also high-speed WiFi throughout the house. The beach access is via the private community shoreline park. The park features picnic tables and a boat launch perfect for your kayak or board-sporting needs. The beach is walkable but rocky, so pack your sturdy sandals if you want to explore. While we do not provide bedding for babies, children of all ages are welcome. Your dog is welcome on a case-by-case basis at an extra fee. The yard is not fenced, so please be respectful of neighbors and plan to keep your dog leashed when outside. Dogs cannot be left unattended in the house. There is NO smoking of any kind of in the home or on the property. We love South Whidbey Island and would like to share it with you. With that in mind, please respect the home as you would your own. Welcome to Whidbey Island, we look forward to your stay! 9 Miles to the charming community of Langley with shops, restaurants, pubs, galleries, theater and entertainment. Views of Puget Sound and shipping lanes. The cottage was very clean and had all of the supplies we needed for our stay, could not have asked for more. Bed was very comfortable and the rear deck view was amazing. Would definitely stay here again!